Sendy built its identity on the stellar pricing and deliverability record of Amazon’s SES (to wit, Sendy’s homepage proclaims: “Send newsletters, 100x cheaper via Amazon SES”). The full pricing for SES can be found here but it is around 10 cents US ($0.10) for every 1,000 emails sent. If you host your Sendy install on an EC2 instance then you also get the first 62,000 emails free per month. Believe it or not, I actually prefer not to use Amazon SES with Sendy. I find dealing with SES unappealingly bureaucratic: raising of delivery limits (even from 0 to 100/day) must be done through a ticketing system with manual review, which I find annoying. 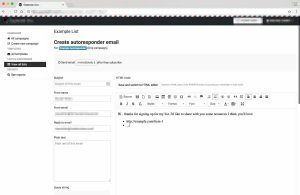 I now prefer Mailgun as an upstream email service provider for Sendy. 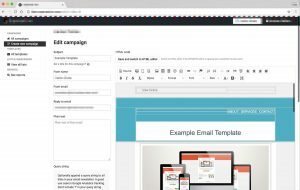 Mailgun gives you 10,000 emails a month for free, then tiered pricing for amounts above that. You can even host your own Postfix server if you have the energy to do so (you can find a guide to setting up SPF and DKIM with Postfix here) but I think in most cases a paid provider will wind up being so cheap that it’s not worth the hassle to bother doing this. Click through any of those links and you should get a sense for approximately what you will end up realistically spending on email delivery at your particular volume when using Sendy. One thing worth noting is that because hosted providers like Mailchimp, AWeber, Constant Contact, etc. work zealously on compliance, their IPs are often not just kept off of the blacklist, but they are often in fact whitelisted by spam filters almost completely assuring delivery. I am not sure that you will always have this assurance with the SMTP hosts listed above so it is something to take into account, though they and Sendy will both give you deliverability stats and my own deliverability has been near perfect so far. So far we’ve focused mostly on the cost of email delivery with Sendy. Truth is this is what most people who have taken a look at Sendy are interested in. Most people know instinctively that the pricing of fully hosted/integrated email marketing solutions like MailChimp and AWeber is high, even for subscriber counts in the low thousands. In my opinion, however, you do get great value from such platforms as far as campaigns being able to achieve a very professional appearance and function even with relatively non-technical administrators. 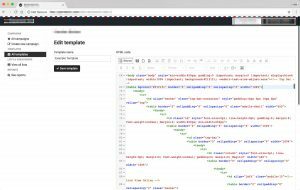 Both MailChimp and AWeber have highly polished default templates, and template editors that are very advanced. This is something that I really think is important to have in mind when considering Sendy. You can certainly construct highly polished and professional campaigns with Sendy, but it will require some technical knowledge. This is because there are zero supplied default templates, and the campaign/template editing interfaces are basic compared to those of hosted services. To achieve professional results, in my opinion, you will likely need to get a hold of third party email templates (such as through ThemeForest) or code your templates in some external environment (believe it or not, Dreamweaver is still an industry standard in this area). Accordingly, you probably want somebody moderately technical and comfortable with HTML email templates and external editing environments involved in managing your campaigns if you decide to go with Sendy and want highly polished campaigns. 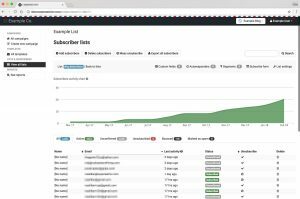 Sendy allows unlimited lists and list subscribers. I find the list management functionality to be pretty good and to stack up with hosted commercial services. There is good high level reporting (with charts) as well as support for custom fields and list segmentation. You can easily export lists by CSV through the interface should you ever have a need to switch to a different service. Sendy offers a ready-to-use embeddable form from the list administration interface. This form is similar to the embeddable Mailchimp forms that you will find widely used on the internet. It is simply a very basic HTML form pointing to a endpoint on your Sendy host and with a parameter indicating the list. Double opt-in is supported and recommended for protecting reputation/deliverability. Sendy has comprehensive reporting throughout. Once you have sent a campaign, you will get a well-structured graphical report encompassing opens, specific link clicks, bounces, unsubscribes and even a geographical breakdown. Furthermore all of this data can be easily exported in CSV format. You get similar reporting at the list level. For each of your mailing lists you get a rich graphical representation of active subscribers, subscribers who never confirmed, unsubscribes, bounces, and incidences of being marked as spam. 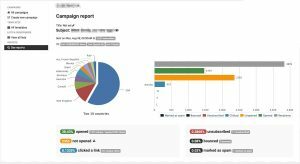 The suite of reporting in Sendy is comprehensive enough for you to keep on top of campaign success and all the info that might impact your sending account’s health/reputation. 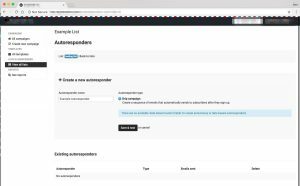 I do feel that the autoresponder functionality built into Sendy is not quite comparable to bonafide “marketing automation” features you might find in commercial software (i.e. things like rule-based “workflows” that you find in competing products). You can certainly hack this sort of functionality via the API but won’t be a first-class feature as with other products. Sendy exposes functionality via an authenticated API (see documentation here). This is very useful if you have an interest in things like creating highly-optimized sign up experiences, integrating with ecommerce frameworks, or doing advanced list management taking into account factors outside of Sendy (like registrants’ recent purchases or activity on your site). When you intend to trigger the transactional email, add a user to the list through the API with tags to pass any data you need to to the template. I’m honestly not sure whether this hack will work if the same email needs to be triggered multiple times for the same customer, however (without removing them from and re-adding them to the list) – such as you might want for an order confirmation email where a customer may purchase several times over from you using the same email. Sendy’s absence of first class transactional email functionality never bothered me because I have mostly used the tool for maintaining ordinary mailing lists. Unless you actually need consolidated reporting, it is usually much more robust to template transactional emails in the application they are coming from and deliver them directly through SMTP (this is what things like WordPress, Megento and any Ruby on Rails application utilizing the stock ActionMailer library will do by default). I love Sendy for my own needs and I believe it could suit many others’ needs. I do think that anybody considering Sendy should take into account their priorities. If you are a commercial operation for whom the $10s-$100s (or more) a month you might spend on a more expensive alternative are a drop in the bucket, you may want to go that route as I believe you will have an easier time achieving polished results and stellar deliverability and you will probably save quite a lot of time overall. Similarly I’d say that if you are relatively non-technical and have a desire for very polished campaigns you also might be best off with tools like Mailchimp so long as your list isn’t in the many hundreds of thousands (see here for pricing of Mailchimp’s “Growing Business” plan at various volumes – you can also use Mailchimp’s “Forever Free” plan as long as you have fewer than 2,000 subscribers). I think Sendy is a great fit for cost-conscious startups and semi-technical people who have the wherewithal to deal with it’s somewhat more DIY aspects and don’t want to worry about lock-in to their email provider. Even though it is not a truly Free Open Source project, I think there is sort of an analogy that could be made to WordPress: Sendy probably appeals to the sort of people who opt to host WordPress on their own servers vs. using WordPress.com, Medium, etc. 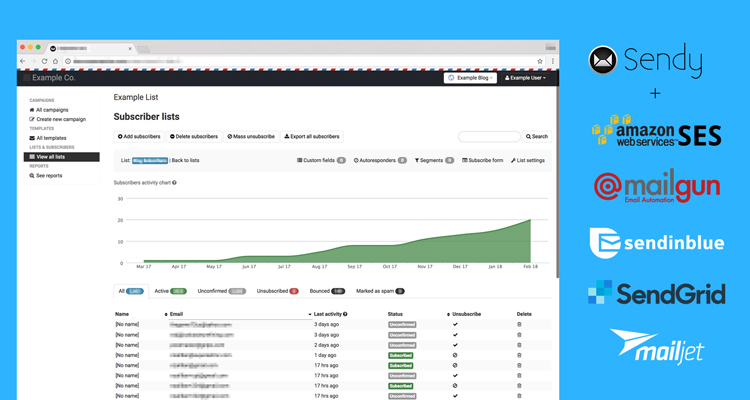 Sendy has a live demo that you can log into and play with test campaigns. I think that when you try Sendy it becomes immediately clear whether it’s going to work for you or not. I encourage you to try the demo as the experience is really identical to the experience of using your own live Sendy install. While I wish Sendy offered something along the lines of a 30 day free trial, they do say on the site that “If it doesn’t work out, we’ll refund you”. For my purposes I have been very happy with Sendy.